Our eyes are constructed for near and far vision. Nearsighted vision is a class of refractive error of the eye commonly known as short-sightedness or Myopia. Myopia refers to blurry eyesight caused by nearsightedness, or the inability of the eye to focus the far away objects. The degree to which the person is myopic depends on the powers of the retina, powers of lens and the length of the eyeball. A combination of multiple genes and environmental factors play important part in the development of myopia. The cause of Myopia can be partly hereditary. A familial incidence has been noted in myopia i.e. the chance of getting myopia to the child is more if both parents are myopic. Environmental or external factors like strain on the eye or damage in the eyes can also lead to myopia. Most eyes with nearsightedness are healthy, but in severe cases of myopia, retinal degeneration happens. Nearsightedness get worsen with the growth years. Nearsightedness affects both males and females, often seen in children and teenagers. The major reason for congenital myopia is the obstruction along the visual pathway such as cataract. The resulting blur and elongation causes, a myopic eye. Myopia definition: The light entering the eye is incorrectly focused on the retina, results in blurred vision of far-away objects, at the same time close objects are focused properly. The condition of myopia or nearsightedness is owing to the low optical length than the physical length of the eye. Myopia occurs in two stages, spastic myopia and axial-length myopia. The first stage is a reversible form of myopia known as spastic myopia. When the underlying cause is treated the eyes restore normal vision. Spastic myopia affects the lens and it usually foregoes the formation of axial-length myopia. If the spastic myopia is tolerated for long time it results in stretching of the coats of the eye. The second stage is the irreversible form of myopia called axial-length myopia. The coats of the eye get thinner as they stretch. The cause of this type of myopia is an abnormal elongation of the eye along its visual axis and a minor switch from the normal in the axial dimension of the eye is adequate to cause blurring. Axial-length myopia is often seen associated with a sustained high pressure in the vitreous chamber of the eye. The prevention requires knowledge of cause. The ophthalmologist’s challenge is to find out what causes and what worsens myopia. The common method of myopia correction is the use of corrective lenses such as eyeglasses or contact lenses, which can adjust the focus shift of the light from the image, bringing out a clearer image. The negative optical power (concave) in corrective lenses helps in compensating the extra positive diopters of the myopic eye. New surgical correction or laser methods can eliminate the power permanently. LASIK is the most common surgery for myopia. 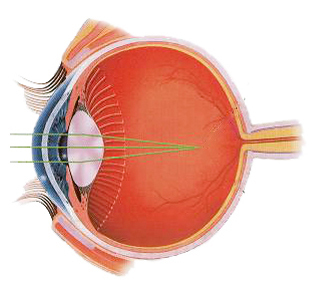 This technique reshapes (flatten) the cornea and helps in shifting the focus using an excimer laser. For myopic patients whom laser surgery is not possible, lens implants can be done. Lens implants function as corrective glasses and helps in myopia correction.